If it wasn't for Equity rules barring such practices, one could easily believe that there were several actresses named Julie Walters. There's the comedienne who's been Victoria Wood 's sparring partner since the early 1980s in such sketch shows as Wood and Walters (ITV, 1981-2) and Victoria Wood - As Seen On TV (BBC, 1985-7). There's the character actress beloved of Alan Bennett and Alan Bleasdale , who have written numerous parts specifically for her in such television masterworks as Talking Heads (BBC, 1988) and G.B.H. (Channel 4, 1991). There's the Oscar-nominated and BAFTA-winning film actress who starred in Educating Rita (1983) and supported Billy Elliot and Harry Potter. Surely they can't all be the same person? Born in Birmingham on 22 February 1950, she originally trained as a nurse before studying English and Drama at what was then Manchester Polytechnic, meeting Victoria Wood when both applied at the same time. Much of the 1970s was spent with the Liverpool Everyman theatre company (a 1976 stage appearance is preserved by the BFI-funded film Occupy! ), though she also began to play small television roles, most memorably in the opening scene of Alan Bennett's Me! I'm Afraid of Virginia Woolf (ITV, tx. 2/12/1978). That same year she first worked professionally with Victoria Wood, initially in the Bush Theatre revue At The Death and then in Wood's play Talent (ITV, tx. 5/8/1979) and its sequels. Their on and off-screen friendship was cemented by Wood and Walters , whose 1981 pilot followed by a seven-part series in 1982. In addition to Victoria Wood - As Seen on TV (including the spoof Acorn Antiques, whose doddery Mrs Overall was cited as Walters' favourite of all her characters), Wood and Walters have also worked together in the sitcom dinnerladies (BBC, 1998-2000) - in which Walters played Wood's borderline-demented mother - and several one-off dramas, including the six plays making up Victoria Wood (BBC, 1989) and Pat and Margaret (1994). This last saw Walters played the jet-setting celebrity who is less than thrilled to be reunited with her downtrodden sibling (Wood). The early 1980s also saw Walters spreading her wings as a character actress, with parts in Alan Bleasdale 's seminal Boys from the Blackstuff (BBC, 1982) - where she was Angie Todd, long-suffering wife of Michael Angelis 's Chrissie - and more substantial roles in Alan Bennett plays. In Intensive Care (BBC, 1982), she drew on memories of her earlier training when she played the nurse who distracts Bennett from his dying father, while Say Something Happened (BBC, 1982) cast Walters opposite Thora Hird and Hugh Lloyd as a gauche social worker whose advice to an elderly couple is initially less than helpful. But the role that made her a bona fide star was the title character of Willy Russell 's play Educating Rita , which Walters first created for the Royal Shakespeare Company production that opened in June 1980 prior to a West End transfer. 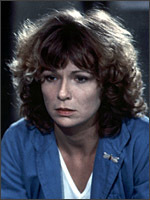 Her recreation of the role for the film version (d. Lewis Gilbert, 1983), in which her bright but brash working-class Liverpudlian Rita enrols on an Open University course, won her a BAFTA and an Oscar nomination. This led to several feature film leads later that decade, though only Personal Services (d. Terry Jones, 1987), in which her character was modelled on notorious Streatham 'madam' Cynthia Payne and Buster (1988), where she played the wife of Great Train Robber Buster Edwards , truly matched her best television work. There was also a delicious cameo in the Alan Bennett-scripted Prick Up Your Ears (1987), in which Walters encapsulated an entire marital history in the line "He's my husband - ignore him". Her second Oscar nomination was for dance teacher Mrs Wilkinson in Billy Elliot (Stephen Daldry, 2000), refusing to let a potential star's working-class mining-family background obstruct his ballet career. Mrs Weasley in the Harry Potter films (2001-2011) barely stretched her, but brought her a substantial younger following, while the ABBA-scored musical Mamma Mia! (d. Phyllida Lloyd, 2008) saw her holding her own opposite Meryl Streep and Pierce Brosnan . In addition to her television work with Victoria Wood, she also appeared as Adrian Mole's mother in The Secret Diary of Adrian Mole Aged 13 ¾ (ITV, 1985), blithely confessing "I squander it on gin and cigarettes, love" when he asks her what she does with her child benefit. Her best work for Alan Bennett came in Talking Heads (BBC, tx. 17/5/1988), in which 'Her Big Chance' was a monologue by an actress far less successful than Walters, and too naïve to realise what kind of production she's been asked to appear in. A decade later, in 'The Outside Dog' episode of Talking Heads 2 (BBC, tx. 27/10/1998), her obsessive-compulsive character Marjory is trying to wipe away her husband's appalling secret. She reunited with Alan Bleasdale for all his subsequent major TV series, contributing a brilliant supporting turn in G.B.H. (Channel 4, 1991) as Robert Lindsay's mother (despite being a couple of months younger than him in real life), and then a lead as his harassed wife in Jake's Progress (Channel 4, 1994). She also appeared in Bleasdale's two period adaptations, the thriller Melissa (Channel 4, 1997) and as Mrs Mann in his opening-out of Dickens' Oliver Twist (ITV, 1999). More recently, she has delivered brilliant impersonations of real-life individuals. These included Diana Longden (the ME sufferer at the heart of Wide-Eyed and Legless , BBC, tx. 15/7/1994), Northern Ireland peace campaigner Bernie McPhelimy ( Titanic Town , d. Roger Michell, 1994), Dr. Anne Turner, who committed assisted suicide in a Swiss clinic ( A Short Stay in Switzerland , BBC, tx. 25/1/2009), clean-up TV campaigner Mary Whitehouse - a more nuanced take than the title Filth! The Mary Whitehouse Story (BBC, tx. 28/5/2008) might suggest - and Mo Mowlam, the popular Labour minister who refused to let a brain tumour derail her career ( Mo , Channel 4, tx. 31/1/2010). The last performance won her a sixth BAFTA, and she has also been awarded the OBE (1999) and CBE (2008). She published her autobiography 'Seriously Funny' in 2003.